*These pictures are only examples of what to expect. Due to individual computer preferences the color of the wood you receive may differ. Baltic Birch Plywood is unlike traditional plywood you're used to seeing. It is manufactured in the Baltic region of northeastern Europe using solid one-piece Birch veneer for each ply. The plys are cross-banded (alternating grain direction) and held together with strong interior grade glue. This results in a plywood that not only looks good but has exceptional stability and strength. Our Baltic Birch Plywood is top grade without voids or glue pockets. No formaldehyde added. Thickness 12" x 12" 12" x 20" 12" x 24"
1/8" Baltic Birch Plywood 12"x12"
1/8" Baltic Birch Plywood 12"x20"
1/8" Baltic Birch Plywood 12"x24"
1/4" Baltic Birch Plywood 12"x12"
1/4" Baltic Birch Plywood 12"x20"
1/4" Baltic Birch Plywood 12"x24"
3/8" Baltic Birch Plywood 12"x12"
3/8" Baltic Birch Plywood 12"x20"
3/8" Baltic Birch Plywood 12"x24"
1/2" Baltic Birch Plywood 12"x12"
1/2 Baltic Birch Plywood 12"x20"
1/2" Baltic Birch Plywood 12"x24"
3/4" Baltic Birch Plywood 12"x12"
3/4" Baltic Birch Plywood 12"x20"
3/4" Baltic Birch Plywood 12"x24"
Custom sizes of Baltic Birch are available. Contact us for prices. Why Choose Baltic Birch Plywood? Baltic Birch Plywood is manufactured from solid one-piece birch veneers layered and glued in alternating grain directions. This results in a product that is exceptionally strong and not as prone to warping as most other plywoods or solid hardwood. In fact the 3/4" thickness with 13 plies remains very flat and has barely any movement with moisture content changes. The thin pieces like the 1/8" thickness while more stable than solid 1/8" hardwood are still prone to warping like any thin wood product. This, however, usually isn't too much of an issue. Unlike traditional plywood with paper thin veneer on the outside Baltic Birch Plywood features thick outer veneers that is more resistant to damage and is not as easily sanded through. 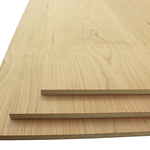 All our Baltic Birch Plywood sheets are B/BB grade. The front side is clear and free of defects like large knots. Small pin knots and some dark streaks are allowed. The back side may occasionally have a few football shaped patches where a knot was removed. Baltic Birch Plywood comes in large sheets and is one of the few wooden sheet-good materials that is consistently dense enough through its thickness to be cut with a laser. And while it is more stable than solid hardwood the thin stock like 1/8" and 1/4" is simply to thin and wide to always stay perfectly flat. Most pieces will lay flat enough to cut right on your laser bed but consider making a jig or frame to hold more unruly pieces flat. Usually all you need is a few pieces of tape to hold it down to a flat surface. The strength, stability, excellent screw-holding, and low price point makes Baltic Birch Plywood a popular choice for making shop jigs, drawer boxes, cabinet interiors and other rarely seen items. But the uniform plies and void-free endgrain can be attractive if you choose to use Baltic Birch for more decorative applications. Baltic Birch Plywood also makes a great base to apply a thick veneer to; like our 1/16" and 1/8" hardwood material.